Join us! Step 2 – Sign our waiver! Rest when you need to, modify when you need to, and most importantly, have fun! Mat and towel rentals are available. You are welcome to store your mat at Urban Yoga Spa, but we are not responsible for lost or stolen items. We have day lockers available for your convenience, but please bring a lock to secure your items while you’re in class. 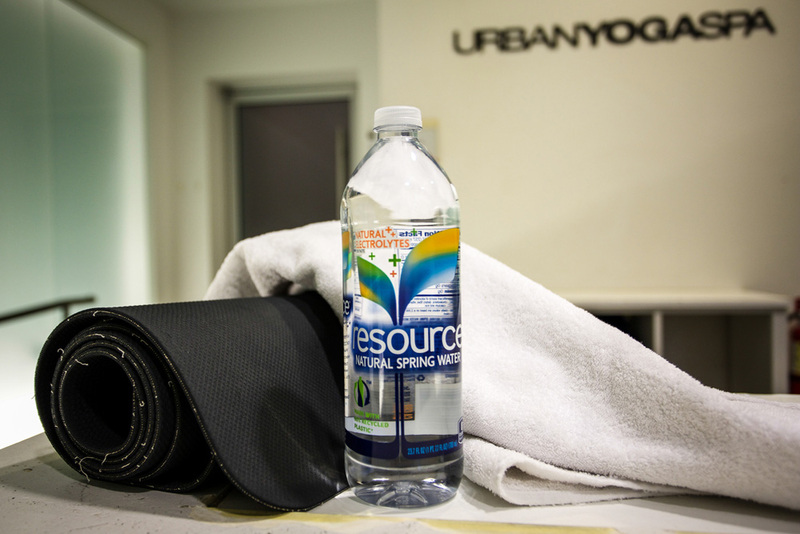 There’s no doubt: yoga culture at Urban Yoga Spa or any studio might be daunting. Whether you’re new to our yoga studio or you need a refresher on the rules, here are some general tips and tricks for making your practice a pleasant one for you and your classmates. Being in a hurry is already a tizzy-inducing situation, but rushing into a yoga class is stressful for both you and your classmates. Scurrying into a class after it’s begun is embarrassing, and it’s distracting for your fellow yogis. Be sure to arrive on time, giving yourself the minutes you need to check in, put away your items, roll out your mat, and gather any props you’ll need for class. Got a few extra minutes before class begins? Sit quietly and focus on your breath, or do a few gentle stretches to warm up. Yoga is practiced with bare feet, and shoes, flip flops, slippers need to be kept outside the studio entrance. Many teachers like to give gentle (or sometimes more intense) assists in class, like guiding you deeper into a pose or shifting your position to correct misalignment. If you’re sore, injured or just don’t feel like being touched, tell your teacher before class begins. This advice swings to both ends of the spectrum. First, please bathe, brush your teeth, wash your hair, and use a clean mat and a clean towel. Second, mind heavy perfumes, oils, and colognes, as strong scents travel easily during class. Regardless of which end of the spectrum you’re on, you’re subjecting those around you to your personal biome. Please make it a tidy and pleasant one. Want to get the stink-eye from classmates? Just bring your iWhatever to class. Whistles, dings, and blips are incredibly distracting and, frankly, downright rude. This behavior borders on unforgivable, and could get your device—or you—kicked out of class. So just put it on silent, right? Not so fast. For many (if not all), yoga class is a chance to escape the digital addictions and distractions we face in everyday life, offering you a rare chance to be fully present. By bringing your phone to class (even on silent! ), you’re distracting yourself and those around you. Expecting an important call or a do-or-die text? Consider skipping class altogether, and returning when you can fully focus. Yoga classes can get packed; when the last-minute stragglers file in, you’ll often see them scanning the room for a strategic spot to roll out their mat. Be neighborly by making room for them, if it’s available. In a less-packed class, it’s common courtesy to stagger your mats so that the person behind you has a clear view of the teacher and the mirror. And unless you’re practicing with your bestie or your sweetie, give your neighbor some breathing room. Lastly, mind your steps: it’s polite to avoid walking on a fellow yogi’s mat. Our studios are considered a space for reflection, self-study, and focus, and maintaining a quiet atmosphere (if not an altogether silent one) supports this frame of mind. 8. Can’t stay for savasana? Leave before. We all get it. Time is short, your schedule is tight, and your day is packed with need-tos and to-dos. But many of your classmates live for savasana, and by packing up and shuffling out during the most meditative and restful stage of the entire class, you’re disrupting everyone else and denying yourself the benefits. The traditional benefits of savasana claim to restore your nervous system to its default settings and offer your mind a chance to sink into meditation. But above all, it’s a rare chance for you to do nothing for a few minutes. Close your eyes, focus on your breath, and feel the weight of your body against the floor. It’s your own little R&R opportunity. Take it. Absolutely, positively have to leave class early? Let your teacher know before class, position yourself close to the door, and be sure to leave before savasanabegins. When it’s time to leave, pack up and scoot out as quietly as you can. Bolsters, blankets, blocks, strap—yoga is a prop-happy practice. If you’re borrowing our props, be sure to return them to their rightful place upon leaving. If you’re borrowing one of the studio’s mats, be sure to hang it up at just outside Studio A at our mat-cleaning station. Leaving your space as clean as you found it is respectful to us and students in the next class. Parking garage located at 3rd Avenue and Stewart Street. Guests can validate their parking ticket at the UYS Front Desk for a reduced parking rate. Stay in touch with UYS. Have You Seen The Latest Research On Yoga? © Urban Yoga Spa All rights reserved.